He started his service in 1774 in Army of Polish kingdom as regular soldier of 2nd Regiment of Infantry of Prince. In 1782 promoted to the rank of ensign and in 1783 of lieutenant. In 1785 given the service of adjutant of commander of Regiment general Wodzicki. Participated in Lithuanian campaign during the war with Russia in 1792. at the moment of the beginning of Kościuszko`s Upraise he was both promoted to rank of captain and served as adjutant of general Tadeusz Kościuszko. After the battle of Racławice promoted to the rank of major and given the post of chef of corps of riflemen. Sent with the mission of starting the Uprise in Warsaw he arrived after the fights had been just started. Fought at Granne, Połaniec and Szczekociny, dignified in defense of Warsaw. At Radoszyce captured by the Russians. 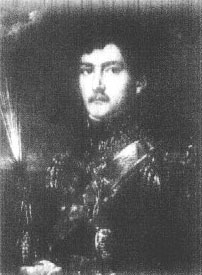 After the return from the captivity returned to the Country because of the fact that he belonged to the social circle of Prince Józef Poniatowski. Got back to the service on 1806. In 1807 promoted to the rank of colonel and chf of the staff of legion of Prince Józef Poniatowski. At the end of 1807 promoted to the rank of general of brigade. Awarded in 1808 with golden Cross of Virtuti Militari. In the battle of Raszyn commended with the right wing of Polish Army. He was fighting also at Sandomierz. In 1810 given the post of the commander of the Departament of Kraków and 4th Division of Infantry. In 1812 served as the Commandant of Warsaw. In 1813 captured by the Austrians with the half-battalion of the convalescents, that was moving towards the army in Saxon. After the releasing from prison he became the commander of the Clothing Commissariat of the Polish Army. In 1826 promoted to the rank of general of division. During the November Upraise of 1830 he became retired. After the fall of upraise he stayed in Warsaw giving the promises to Emperor Nikolai the Ist. Awarded by the orders od Saint Stanislaus and Saint Anna, honorable award for 35 years of the best officer`s service. The member of mason associations.